Recognized in aromatherapy for its antispasmodic properties, the Finessence Organic Tropical Basil Essential Oil is very effective for relieving intestinal pain and spasms. It is useful for soothing bloating, stomachaches after a rich and rich meal but also in case of painful periods. It is also appreciated in atmospheric diffusion for its relaxing and tonic virtues. It is famous for fighting fatigue and stress. The first notes of its fresh and aniseed scent remind us of tarragon. 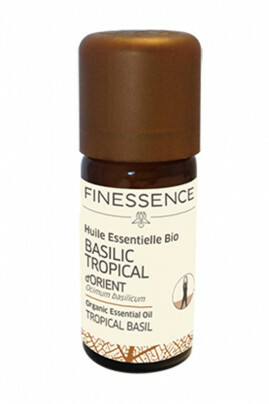 The Finessence Organic Tropical Basil Essential Oil improves the digestive comfort. Atmospheric diffusion : Create a cool atmosphere by adding a few drops of essential oil in your diffuser. Observe the manual of your device for dosing and diffusion time. Cosmetics : In a spoonful of vegetable oil such as Organic Sweet Almond Oil, add 3 to 4 drops of essential oil. Infusion : Mix 3 to 4 drops in one liter of warm water. Beforehand, dilute the organic essential oil in honey or on a piece of sugar which you will then add in warm water to unify the mixture. An essential organic oil with digestive benefits! Ocimum basilicum (basil) oil, linalool*, eugenol*, limonene*. Contains: Methylcavicol, alpha-pinene, beta-pinene, linalool. May cause an allergic skin reaction. Harmful if swallowed. Suspected of causing genetic defects. Suspected of causing cancer. Harmful to aquatic life with long lasting effects.